You are using your Power-Kleen Detergent at this point and may have a few questions. Several questions that are common for new Power-Kleen users are discussed below. Click on the hyperlinks for additional information or contact a StingRay Service Technician for immediate help via phone or email. 1. How do I maintain my chemical concentration or know when to add more chemical? Titration is the best method to determine the detergent concentration in your washer reservoir. Each Power-Kleen chemical has a titration kit that is simple to use and only takes about 5 minutes to determine your concentration. After you have determined the current concentration you can use our Chemical Concentration Calculator to determine the amount of detergent to add to obtain the desired level. 2. Rusting of the washer cabinet and flash rusting of your freshly washed parts are common issues. 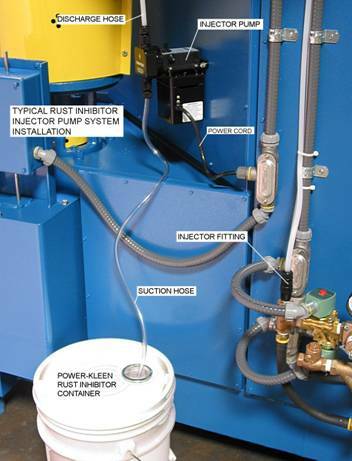 Power-Kleen chemicals have build-in rust inhibitors to protect your machine cabinet. If you see any signs of rust inside of your cabinet it is critical to check your concentration via titration. Some detergents do not provide adequate rust protection. Generally, a detergent in solution with a mixed pH of 10.5 or higher will protect the cabinet. We have pH test strips to determine your solution pH (part #85006). Please contact me if you see any signs of rusting inside your washer cabinet. 3. To protect your rinsed parts from flash rusting after a fresh water rinse, it is necessary to inject a small amount of Power-Kleen Rust Inhibitor into the rinse water. The StingRay Rinse injector pump does this job and can easily be retrofitted to your machine if you find that you need this option. 4. Foaming: Foaming in a parts washer bath is a common issue to work through. Foam is not caused by the Power Washer but by the chemicals and soil combinations in your machine. Many times a higher operating temperature will settle the bath down and prevent foaming or you may need to add more detergent. 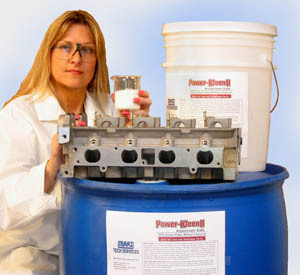 All Power-Kleen chemicals have built in defoamers that work to prevent foam. As a last resort you may add a Defoamer. Please see our foaming troubleshooter if you have foaming issues.